It's time to put the trusty RT up for sale, as its replacement is incoming shortly. - set up for long distance rallies, with all of the gadgets listed below coming along with the sale, with the exception of the 2 GPS's, and the rear tail pack. I will leave the GPS mount for a Zumo 550, which is plumbed into the Autocom system. 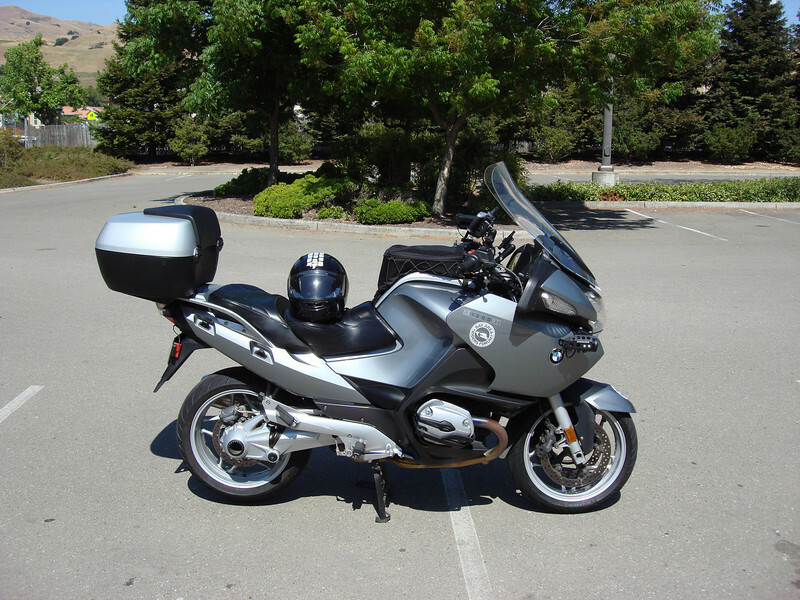 - Will include the Autocom rider/passenger communications system, centech canbus helper, ipod/ipod mount, radar detector & mount, permanent Gerbing heat controller, Cee Bailey shield (and stock shield), custom Rick Mayer seat, the aux lighting, Touratech RT tankbag, and everything else listed below. - Ohlins shocks were just serviced/recharged at 46k miles, they feel great. KBB has the retail price at $9,600, or $10K flat for an ESA bike. 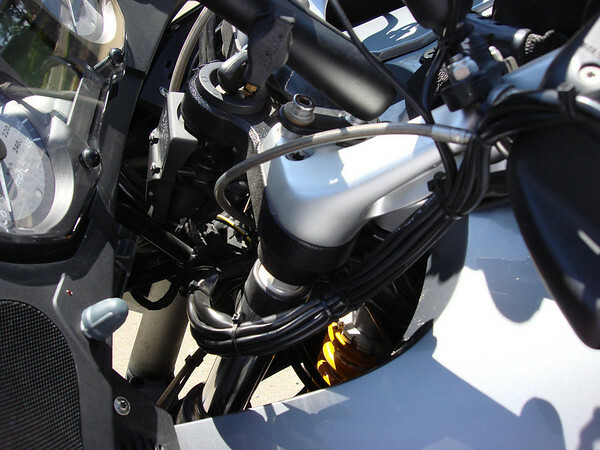 This was/is an ESA bike, but was replaced with the much more capable Ohlins equipment. But - it's tipped over twice, once while parked (darned wind! 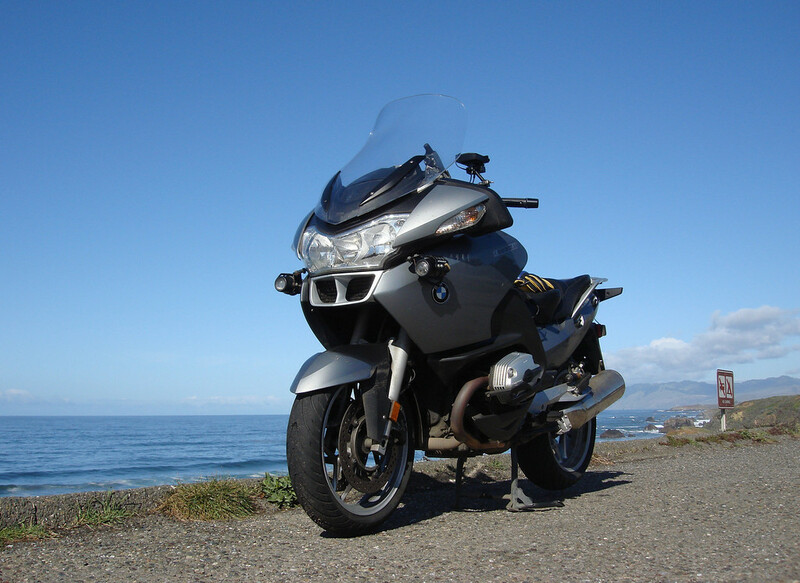 ), and once at < 25 mph on a hairpin turn on the way to an LA ride a few years back. Damage was extremely minor in both cases, and cosmetics were replaced, with the exception of the outside right bag liner. So - asking price is $9,500. This bike has been quite reliable, never having left me stranded or inconvenienced in any way, and it's served me well on 6 straight Cal24's, with nary a burble. 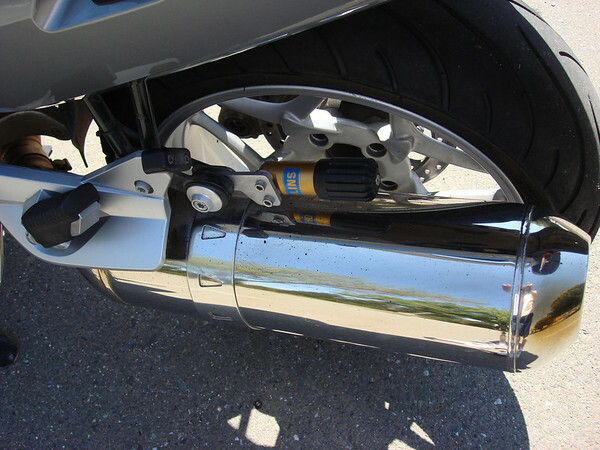 It remains in top-notch mechanical condition, but there are heel scuffs and other minor marks on the bike that show it has been appropriately used. 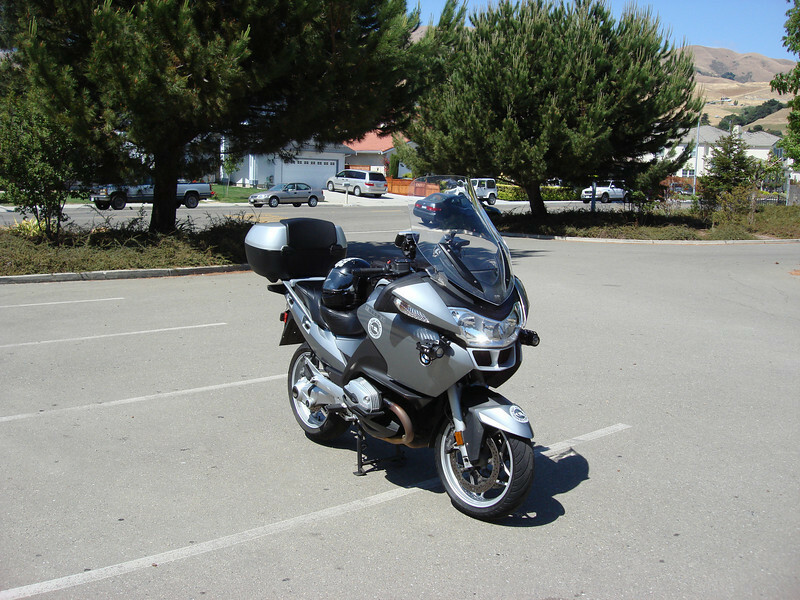 There is an extended warranty that is still in force on the bike through March 2013. The rest of the thread below is copied from this thread in the bike prep area. Please contact me via PM to ask any questions or set up a time to see the bike. 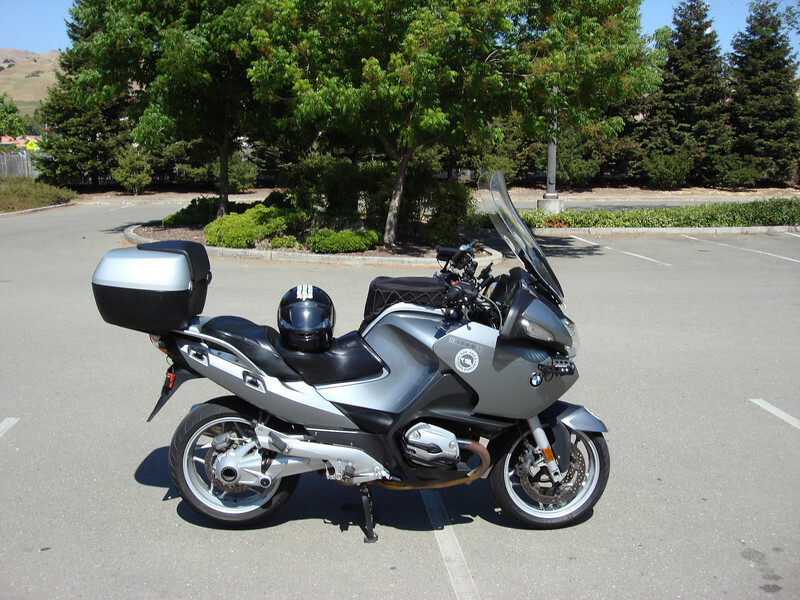 It's a 2005 R1200RT. I picked it up new as a leftover in 2006. It has just about every option BMW offered at the time, save for heated seats. While the bike would be reasonably comfortable and likely competitive in the rally right off of the showroom floor, what fun would that be. So I've added a few gadgets and farkles along the way to make it just a little more capable. From a comfort standpoint, I've got a Rick Mayer seat, which is truly all-day and all-night comfortable, compared to the stock seat that can't claim as much. The bike has a Gerbing heated clothing controller installed on the dash, with the pigtail for my heated jacket liner coming out right at the front of the seat. I can dial up anything from a little extra heat to nuclear. Between the Gerbing and the heated grips, cold simply isn't an issue. I've installed a Cee Bailey windscreen, which is significantly taller and wider than the stock BMW screen. The screen is electrically adjustable, so when it is in the all the way down position I can easily see over it, and am never looking through it in the twisty bits. There are a few gadgets on the handlebars. From the left I have a Valentine One radar detector, a Garmin 60Cx GPS, the iPod Nano, and finally another Garmin GPS, the Zumo. The V1 needs no explanation, but the reason I have two GPS's may. Initially I had meant to replace the older 60Cx with the Zumo, but it turns out that the Cx has some very useful features that were left out of the newer gadget, so I just kept it on the bike. 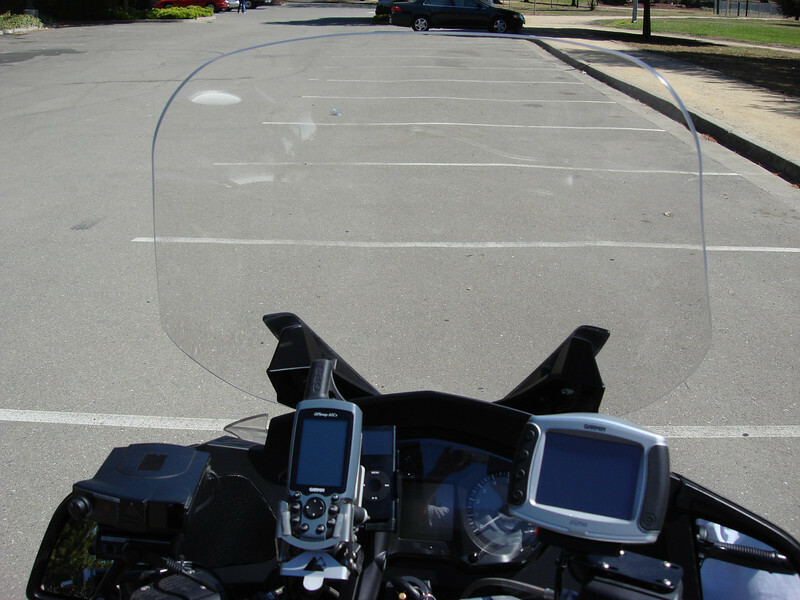 Also, having 2 GPS's on the dash allows me to aim them at different points during the rally. I typically have one always aimed at the next checkpoint, and the other at whatever bonus location I am currently searching for. This lets me know how I'm doing on time compared to the checkpoints, so I always know when it's time to drop everything and head straight for the barn. All of the audio from these gadgets is wired to an Autocom unit installed under the seat, so a single wire coming from there to my helmet allows me to hear all of them at once. The Autocom prioritizes the devices, so for example everything else is immediately muted the second the radar detector sounds an alert. 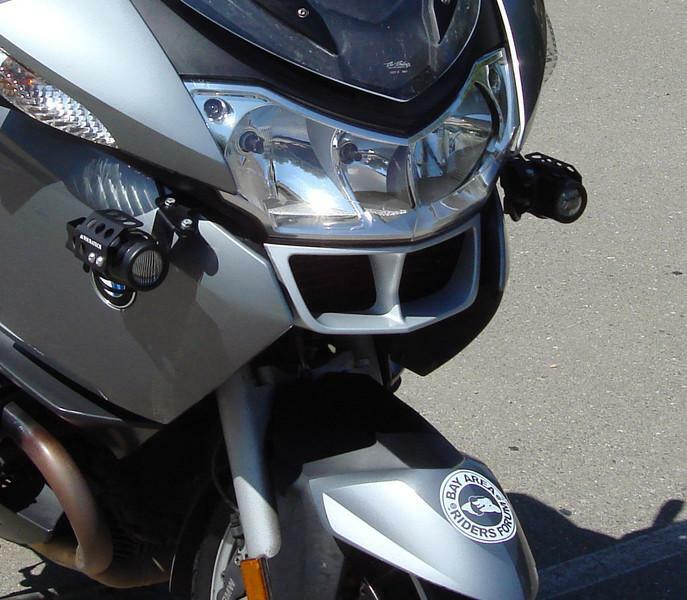 The Zumo connects to my cell phone via Bluetooth, and allows me to make and receive calls on the fly; the audio is piped right through the Autocom to my helmet speakers/microphone. The clarity is surprisingly good, it's easy to hold conversations at speeds much faster than it may be recommended to have conversations at. From a performance standpoint, I've swapped out the BMW's ESA shocks, which had worn out by 15k miles, and replaced them with Ohlins front and rear. The spring rate is set up for a larger than average bear, who likes to ride faster than average on twistier than average roads. It remains a smooth highway cruiser, but it is also surprisingly capable when the going gets twisty. I've run quite a few different types of tires on this bike, and my favorite, by far, are the Michelin Pilot Road 2's (now the Pilot Road 3's). The RT has a 7.1 gallon fuel capacity, and rarely gets less than 38 mpg. 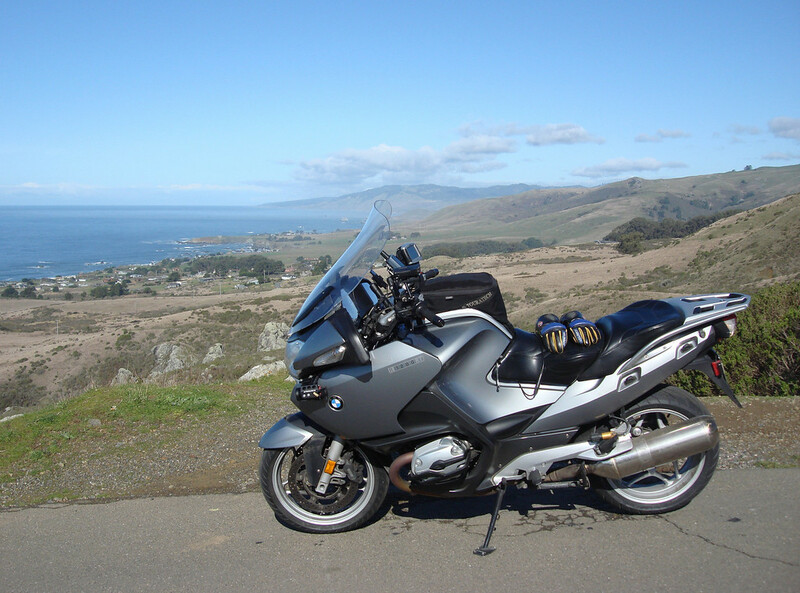 I usually fill up between 200 & 250 miles on a tank, but if I'm in fuel-saving mode I've gotten over 315 miles at a single stretch (on the 2007 Cal24, in fact, the leg before the checkpoint in Lone Pine). The trip computer has a miles-to-empty feature, which comes in quite handy. When it hits zero miles, which it likely will at least once during the rally, there are still 20 miles or so of gas left. Lighting is pretty important on these 24-hr rallies, so I've made some pretty substantial upgrades. Each of the 3 H7 bulbs has been swapped out with Ultrastars, which gave a nice bump in brightness and distance. I also installed two Touratech auxiliary lights; one HID on the left and one fog on the right. The HID is absurdly bright, while the fog is actually more useful for folks to see me rather than lighting up the road. From a safety and reliability standpoint, I've added Hyperlites to the back of the bike to augment the standard brake light, these are two banks of LED's next to the license plate that flash continually when the brake light is engaged. When the 3 bags are installed on the bike, I feel that the stock light isn't as visible as I'd like, and these help.